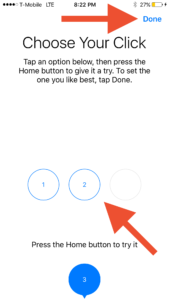 You are at:Home»iPhone»Buttons»How Do I Change The Feedback On My iPhone 7’s Home Button? Here’s The Fix. Luckily, your home button is working perfectly fine. Apple removed the clickable button from the iPhone 7, instead making it a flat, stationary button. When you tap this button, feedback is provided by the iPhone 7’s new taptic engine. The taptic engine is the small vibration motor that slightly vibrates your phone to make the home button feel like a real button when pressed. One of the nice things about the move to the taptic engine is the fact that you can change how your home button “feels” when you press it. In this article, I’m going to show you how to change your iPhone 7’s home button’s click feel. Changing your iPhone 7’s home button tap feel is a very straightforward process. I’ll walk you through it below. Look towards the center of the screen and tap the Home Button option. You’ll notice three numbers at the bottom of the screen: one, two, and three. Tap on these options and then press your home button to preview how the new home button feedback will feel. Once you’ve found the click feel you like, press the Done button at the upper righthand corner of the screen. Your home button feeling has been changed. And that’s all there is to customizing your iPhone’s home button click feel. Let me know what click setting you’re using on your iPhone 7 in the comments. Personally, I use option three as I find it to be the most reminiscent of a traditional button. Previous ArticleMy iPhone Won’t Turn Off! Here’s The Real Fix. Next Article How Do I Retrieve Deleted Email On My iPhone? The Fix!